One of the biggest differences you’ll notice in Microsoft Excel 2010 is the introduction of the Backstage View. 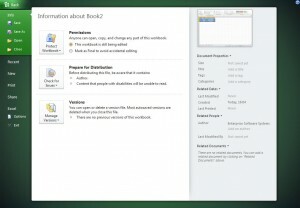 Backstage View is displayed by clicking on the Office Button in Excel 2010, as in all the other applications that comprise Office 2010. The backstage view in each application uses a different colour scheme to differentiate it from the others. In Excel 2010, it is green. To return to the document, you can either click the Back button or press escape. If you want to return to the old Excel 2007 look when you click the Office Button, you can change registry settings, as detailed in this article on Turning Off The Microsoft Office 2010 OutSpace. They’ve actually got the name wrong there; although the registry key is named “outspace”, the display is called Backstage View. I would actually recommend that you don’t revert back to the old Excel 2007 display, as the new Backstage View is better, in my opinion. Although it may slow you down initially because it’s unfamiliar, once you get used to it you’ll find that Excel 2010 becomes easier to use.